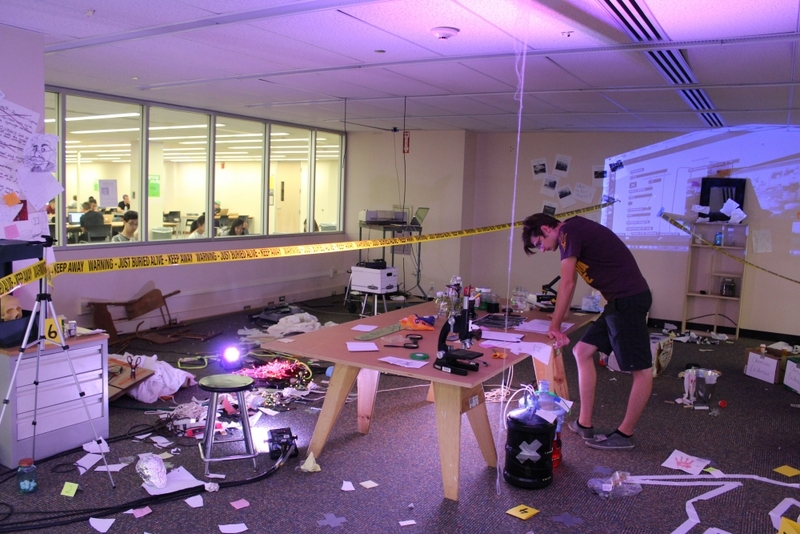 The Prototyping Dreams class’ modern Frankenstein lab is seen on Tuesday, Nov. 1, 2016, at Hayden Library in Tempe, Arizona. Students in an ASU class called Prototyping Dreams are celebrating the 200th anniversary of Mary Shelley's "Frankenstein" by rewriting parts of the novel according to contemporary science. Students worked as a small portion of the umbrella that encapsulates the Frankenstein Bicentennial Project at ASU, a series of events spanning two years celebrating the 200th anniversary of the book's publication. They worked in groups over most of the fall semester to rewrite the story and put together a room in Hayden Library to illustrate their ideas. “The Frankenstein Bicentennial Project is an effort to create a platform to connect with other groups around the world that are going to be celebrating the bicentennial and are thinking about these questions in different ways," Ed Finn, founding director of the Center for Science and the Imagination and professor and creator of the Prototyping Dreams class, said. The Center for Science and the Imagination brings together creativity and science to expand the way people think about science. The Center looks at a full spectrum of research, heavily involving the human element. The Frankenstein celebration was created through the Center. "(The Center) is a research hub operating at the intersection of the hard sciences and the humanities to create new and positive and plausible visions of the future,” said Bob Beard, the curator of the Frankenstein exhibit and a project manager of the Frankenstein Bicentennial Project. The Prototyping Dreams course follows along with this concept, allowing students to create their own prototypes for ideas of the future to improve humanity. The concept of the course is to create stories that could become potential ways of bettering the world through means including science fiction, physical and digital fabrication, film and virtual worlds. The class of 185 students was divided into groups to rewrite the story using the exquisite corpse technique. “There’s this great artistic process called the exquisite corpse, which is when you have different people create different parts of a work of art or take one work of art and add to it or manipulate it in some way so that nobody quite sees the whole," Finn said. The students split into groups and fulfilled the concept by writing the next part of the story based on the group before. Each group had 24 hours in the room to build their idea of a modern day Frankenstein lab, transitioning from the creation of the monster to the crime scene after his escape. Ed Finn said the reason behind the course and the broader vision of the event was to examine scientific creativity and responsibility and discuss how "Frankenstein" has shaped the way science is viewed. Reach the reporter at madison.arnold.1@asu.edu or follow @madisonC_arnold on Twitter.